Welcome and thank you so much for coming in to our store. 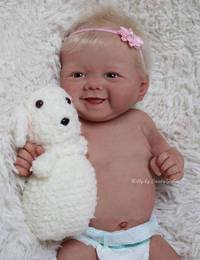 My name is Ann Day and together with my husband Randy Day, we operate The Doll Connection Store, an online only gallery. We are so happy you came in. Take all the time you desire to see amazing dolls we offer. Scroll down this page for some of our favorite selections. You can click on any button on the left to see more selections. Our 'About Us' page lists our history and policies. Ann is celebrating her 32th year in the doll business this year! ANN IS ON YOUTUBE WITH HER BABIES. RIGHT CLICK 'VIDEOS' THEN SELECT "OPEN IN A NEW WINDOW". THIS WAY THIS PAGE STAYS AVAILABLE ON YOUR TOP LINE OF YOUR BROWSER SO WHEN THROUGH LOOKING AT VIDEOS, CLICK ON THE WINDOW FOR THE DOLL CONNECTION TO COME RIGHT BACK HERE. OR YOU CAN CLICK ON 'VIDEOS' AND THIS WINDOW WILL GO TO YOUTUBE SO YOU CAN CHOOSE WHICH BABY YOU WANT TO SEE! HIT YOUR 'BACK' OR 'RETURN' KEY TO COME BACK TO THE DOLL CONNECTION. The customer comments we receive are very important to us. Please take the time to read our latest ones below. Read more we have received over the years going all the way back to our beginning together, April, 2001. Click on the "Customer Comment" button on the left. Our latest customer comment on April 17, 2019: Hello Ann and Randy, Yvonne asked me to send the email, because she can't put Angelina (by Olivia Stone) down. She is a beautiful baby and Yvonne got tears in her eyes when she first saw her. I always get to open the babies and see them first and give them a kiss to welcome them to the family. Yvonne says she is more wonderful than she expected. 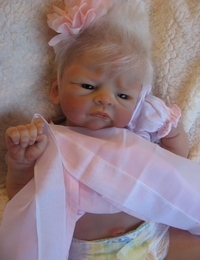 She had to undress the baby and check every part of her perfect body and then brush her hair. I imagine Angelina won't be put down until she gets put to bed tonight. ANN CELEBRATES 33 WONDERFUL YEARS SERVING WONDERFUL CUSTOMERS IN THE DOLL BUSINESS IN 2018! NOTE: BE SURE TO HIT REFRESH ON EVERY PAGE YOU LOOK AT TO GET THE VERY LATEST UPDATES. COME BACK REAL SOON! Click For FBS Dark Bi-Racial Suri From Tasha. Twin To Sawyer, Sophie, And Olivia. She Is Available For Adoption Today! Call Ann Now! 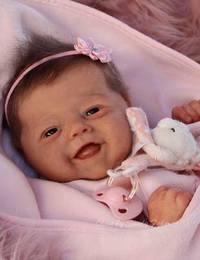 Click For Pics Of Angela Sutter's New Dolls: Scarlett, Maelie, And Michela. 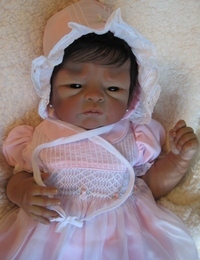 They Are All Very Exquisite, Beautiful, and O-O-A-K Dolls. Click For FBS Callie In AA Skin Color From Tasha. So Precious! Click PBS Tiann From Tasha. Twin To Tea, Tristen. Call Ann Today! Click For FBS Tea W/Blond Hair From Tasha. An Ann Special Pick! Click For FBS Tea DBR From Tasha. An Ann Special Pick! Call Her Now! Click New FBS Sawyer, Twin Brother Of Suri. Be 1st To Order! 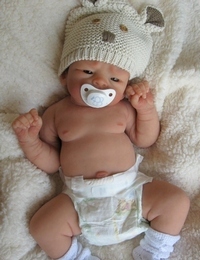 Click For New FBS Liam, Twin Brother To Layla. Welcome Liam! Click For Malia Awake Or Asleep From Tasha. Full Body Silicone! 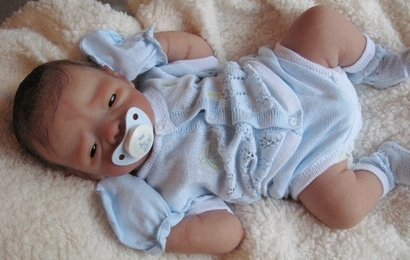 Click Here For Baby Tristen By Tasha. 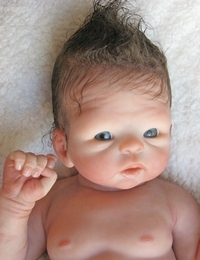 A Full Body Silicone Baby! 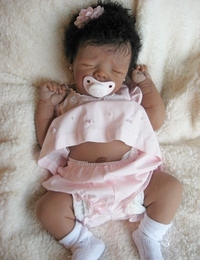 Click For Olivia, PBS Baby Girl From Tasha. Customizing Available. Click For New PBS Noah From Tasha. Lighter Than A FBS Baby! Click For Natalia From Angela Sutter! See Her Beautiful Pictures! Click For Micah Asleep or Awake From Tasha. He Is A Full Body Soft EcoFlex20 Baby, Micro Rooted Hair! Call To Have 1 Made For You! 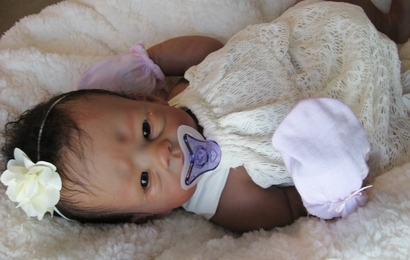 Click For Baby Layla In Dark Bi-Racial Skin Color. She Is Beautiful In This Color, Looks Totally Different. Call Ann Today, Free Layaway! Click For Billy By Master Dutch Artist Sandy Faber. She Is Very Stunning! Click For Roxy By Master Dutch Artist Sandy Faber. She Is So Cute! Click For Olive By Master Dutch Artist Sandy Faber. She Is WOW! Click For Layla By Master Dutch Artist Sandy Faber. See Her Pics! Click For Pics Of Elfin By English Artist Ana Healey. Elfin Is Limited To 10 Editions. Also Twin Sister Erin! Call Ann Today For Details. Click For FBS Madison From Tasha. One Of Two New Baby Twins! Click For FBS Mason From Tasha. One Of Two New Baby Twins! The Doll Connection Store does not send dolls out on approval. 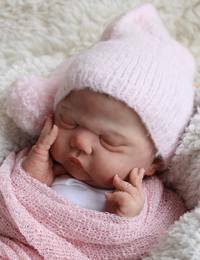 We work as hard as we can to have your baby made by the artist the way that you want her made. In most cases your requested customization is like one you see on our website so it is easy to duplicate. Sometimes your requested customization is like one we have never done before and the creation is outside of the normal requests. 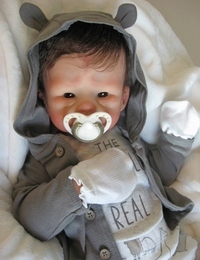 In either case, we make absolutely every effort possible to have the artist make your baby the way that you want. Please keep in mind that the artist is the creator, she is the one that interprets the information and transforms the concept to reality. In all cases it is the customer's responsibility to clearly communicate what they want and to listen to the feedback from us that it is correct. Once your baby is made and delivered, the adoption final. 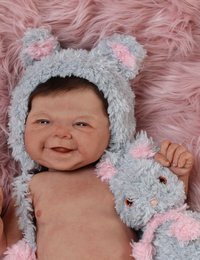 If you want something else done to the baby, we will consult with the artist and see if she would consider doing it. If she does agree to do additional things, the artist's fee plus round trip shipping cost will be the responsibility of the customer and will be collected in full in advance. All of the content and images of dolls appearing in The Doll Connection Store are the exclusive property of The Doll Connection Store. 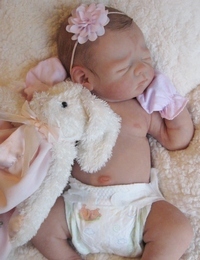 All of our doll images are of brand new, never owned dolls and as such can never be used to sell previously owned dolls that were originally sold brand new by the Doll Connection Store. 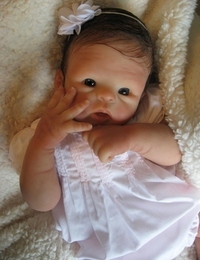 The Doll Connection Store will never authorize the use of our images by others in the sale of their dolls. Use of our images is strictly prohibited. Used dolls should be sold using current images of the used dolls taken at the time of marketing of the dolls. Thank you.